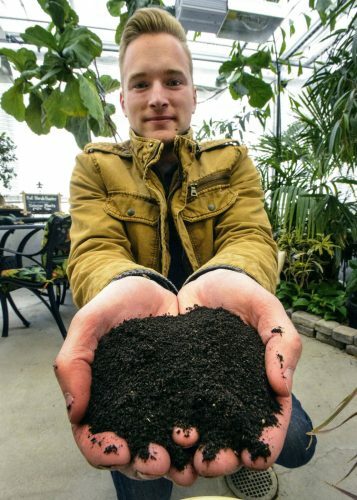 SALT LAKE CITY — An entrepreneurial student who turns worm poop into organic fertilizer targeted for marijuana growers is generating buzz and earning accolades. Joseph Walker, who’s studying at Brigham Young University, began the company OmniEarth to make fertilizer from worm castings — the technical term for worm poop, The Salt Lake Tribune reported. Walker, 22, and originally from Eugene, Oregon, said he became interested in developing an organic fertilizer while working in landscaping and noticing that chemical fertilizers could be a contentious subject. His grandfather suggested worm droppings as a solution. “At first, I’ll be honest, I thought he was crazy. It sounded like a ridiculous idea,” Walker said. After more research and contacting companies already selling worm castings, Walker said he learned that the fast growing marijuana industry was a prime target for his business. Growers often prefer organic and pesticide-free products. Walker found warehouse space and began searching for the right combination of temperature, humidity and water content of the soil to maximize production. The research for Walker’s startup company has been aided by cash prizes won in student entrepreneurship competitions this year. In January, Walker’s company earned a $900 grant from a program at the University of Utah’s Lassonde Entrepreneur Institute. OmniEarth then received $15,000 two months later after it was selected as a finalist in the New Venture Challenge, a competition sponsored by the Rollins Center for Entrepreneurship and Technology. In November, Walker’s company won a regional competition for the international Global Student Entrepreneur Awards. The overall winner to be selected in Toronto in April will receive $50,000.